On Friday and Saturday nights, at 8pm we also perform traditional Chinese Noodle Shows, which you have to see to believe. These shows are customary in China but rare in the United States. Watch in astonishment as our chefs start with a slab of dough. Then twirl…twist…stretch. 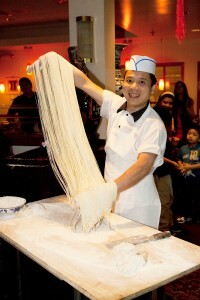 In just a minute, that slab becomes hundreds of thin noodles, which are put fresh into the soups and dishes you enjoy.